I stayed last night at Tanagura Town after bike climb to the summit of Mount Yamizo. This morning, before leaving the town I visited two of the historic sites. A photo above was one of them, which was called Baba-tsutsukowake Shrine. 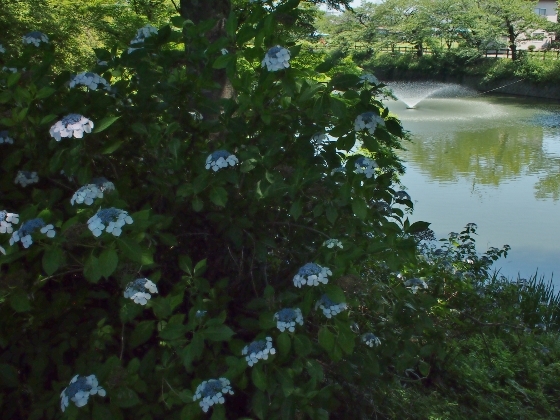 The shrine was established in this place in 1624 by the first lord of Tanagura domain Niwa Nagashige. An ancient legend Yamato-takerunomikoto and one another were enshrined. 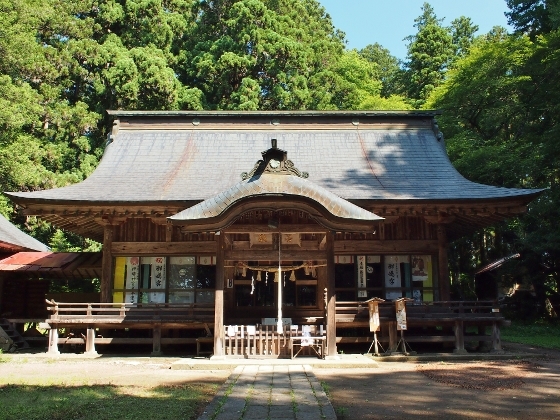 The shrine had been the most prominent one or “Ichinomiya” in Tohoku region. The main building ‘hondo’ was designated as a national important cultural asset. Saigo Tanomo who had been a chief retainer for Matsudaira lord family in Aizu once served as a chief priest for this shrine after the new Meiji Period started. A board above explains about his career. 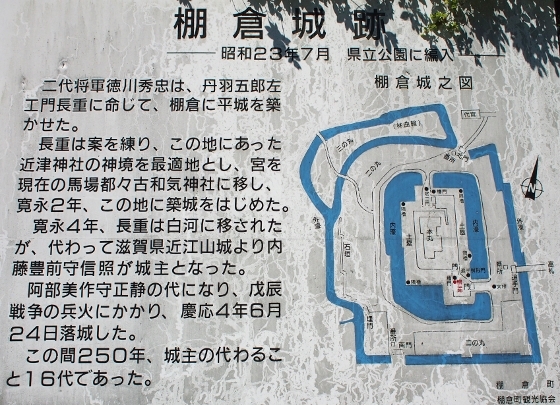 Then I visited nearby Tanagura Castle site. 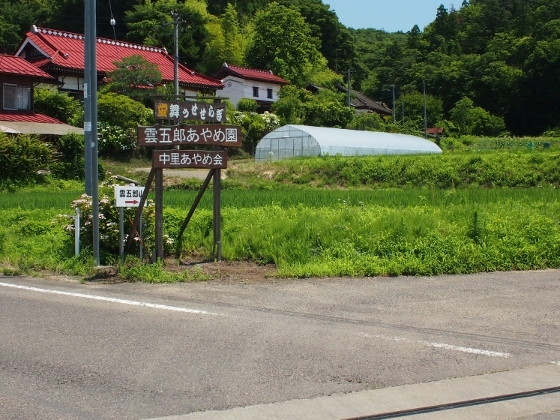 Tanagura feudal domain was established in 1622 with small scale of 50,000 ‘goku’, where one goku is equivalent of rice necessary for a person for one year. 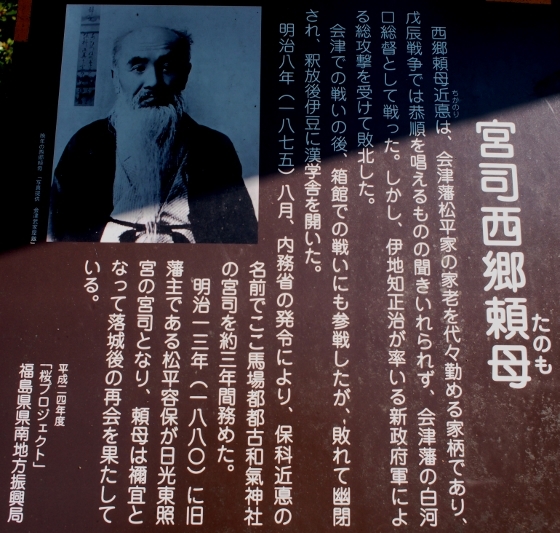 The first lord was Niwa Nagashige and he built Tanagura Castle two years later in 1624. Niwa Nagashige himself was moved to Shirakawa two years later and became the first lord with 100,000 ‘goku’. Tanagura Castle continued for about 250 years before it was burnt down in 1868 during Boshin civil war. A board above explains the details. Photo above shows a part of inner moat with a fountain. All the structures were gone and only the Honmaru ground in the center, inner moat, and some of stone walls were left at the site. 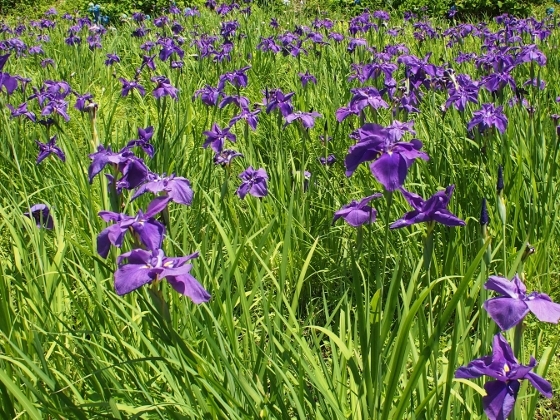 Finally, on the way back home I stopped at Kumogoro iris garden in Asakawa Town. It was located on the foot of Mount Kumogoro in the town. A sign board for the entrance is shown in the upper photo above. Local people have taken care of the iris garden for about 20 years and it showed beautiful scenery during every best season. Today, the season was almost over and only a part of the iris flower field was left as shown above. A local man was taking care of the plants when I visited and the next best season in late June is highly expected. The inn I stayed last night at Tanagura was Akadate Ryokan located on a hillside. This family operated inn was actually like a business hotel with two good meals. Despite its old rustic exterior, all the rooms inside were renovated in a modern style and the owner family were very kind. With this quality the charge was very reasonable (7500 yen).